With a tight budget, we developed an interpretation strategy that took advantage of our off-the-shelf products where possible to create an engaging as well as an informative space. 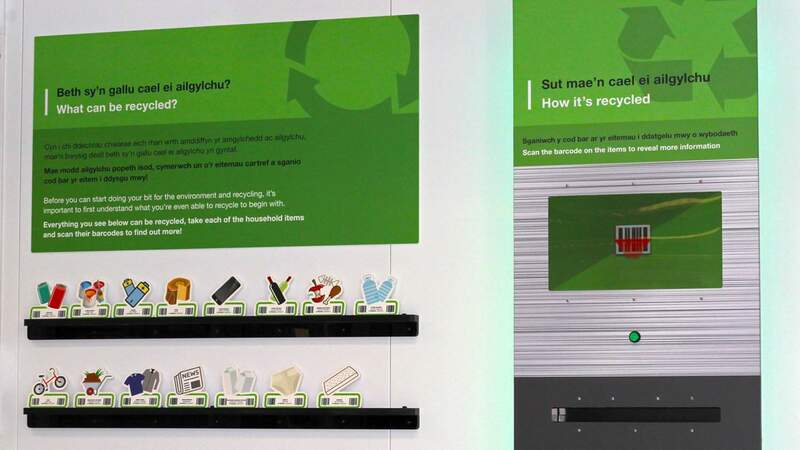 In rural South Wales Amgen Cymru operates the Bryn Pica waste management facility, as well as seven other additional facilities. 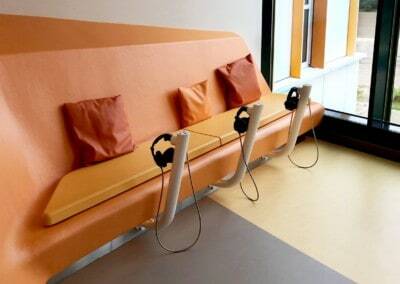 The company is ‘fully committed to the continued war on waste’. 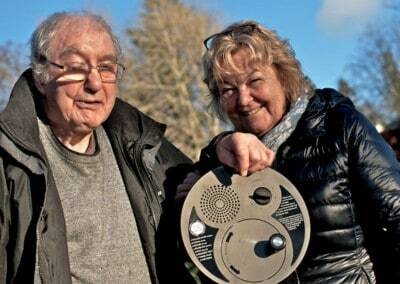 They formed in 1993 and are in partnership with the Rhondda Cynon Taf County Borough Council. 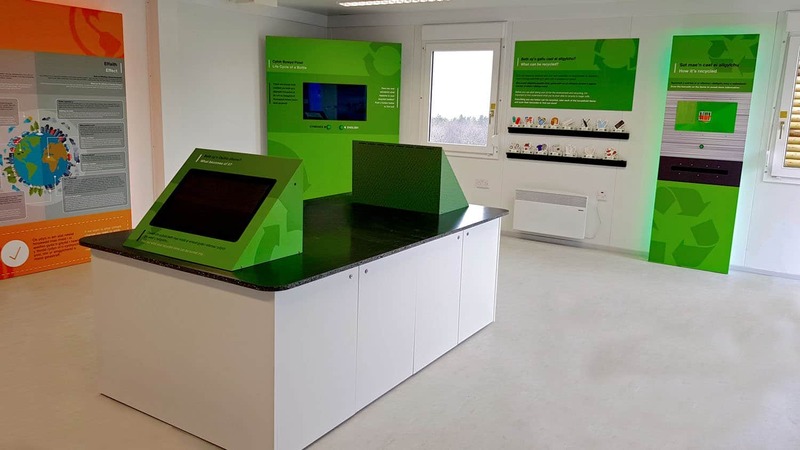 We were approached to design and develop an interactive visitor centre where school groups can come and learn about the benefits of recycling. The project provides children with a greater understanding of recycling and why it’s important. The visitor centre is divided into 4 coloured sections, each designed to cover a different aspect of recycling. 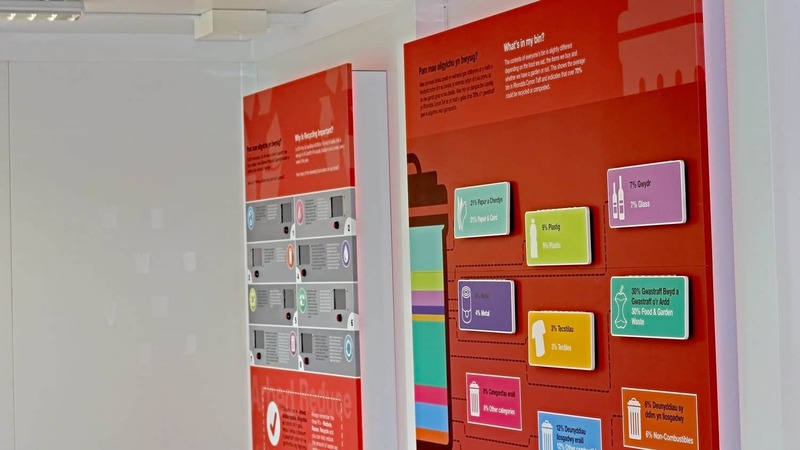 The red zone looks into ‘WHY’ we recycle, the orange zone investigates the ‘IMPACT’ of waste that isn’t recycled, the green zone uncovers ‘WHAT’ we recycle and ‘HOW’, whilst the blue zone educates visitors on what they ‘CAN DO’ themselves. With a tight budget, we developed an interpretation strategy that took advantage of our off-the-shelf products where possible to create an engaging as well as an informative space. As groups enter the building, they are faced with the first zone. 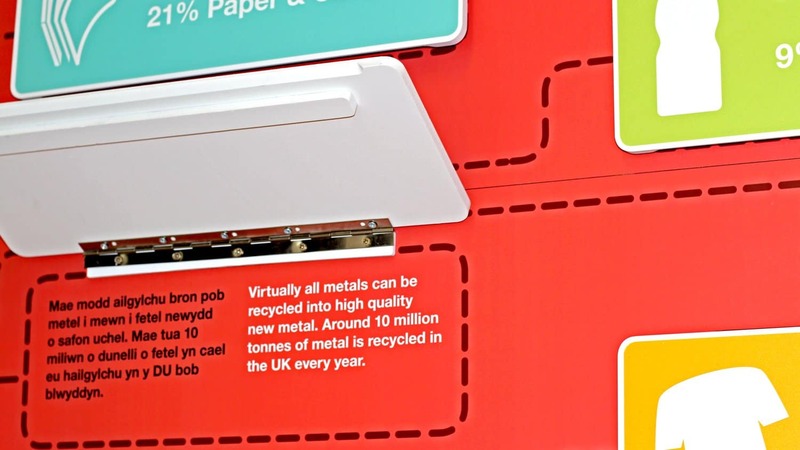 The red zone includes two signage units that look into why recycling is important. 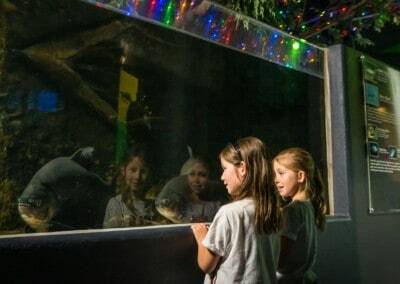 Visitors first interact with a video wall which incorporates signage with a series of multiple-choice questions displayed on 8 of our 7″ open framed video screens. 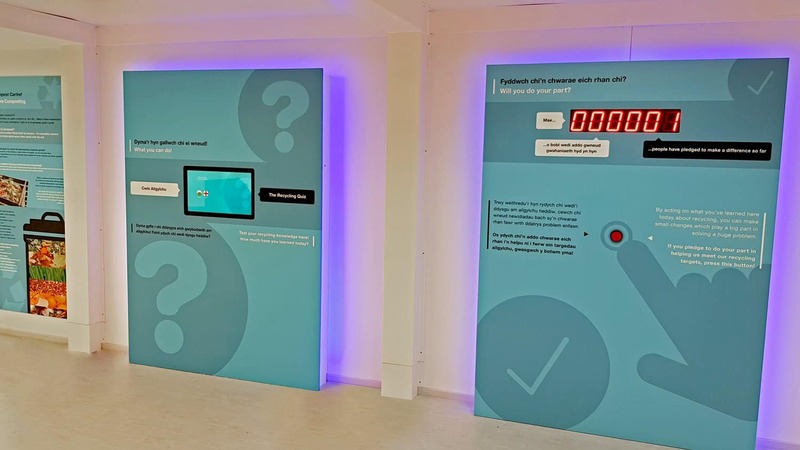 The addition of our open framed video screens utilised as a questionnaire adds an interesting twist to otherwise standard signage. The signage displays questions, while the video screens list multiple choice answers, upon the push of a button the correct answer is shown. The second panel looks into the different types of waste you find in an average bin. 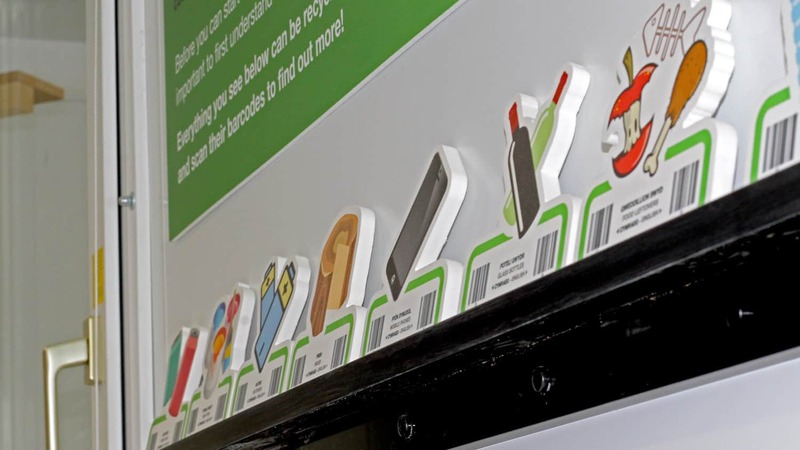 Visitors lift panels which display the percentage of various waste groups that go into your bin alongside other information. 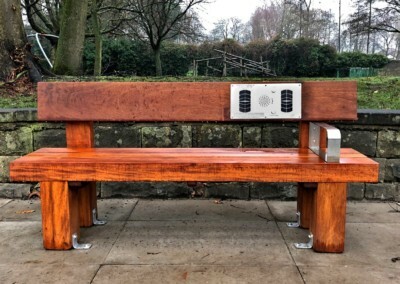 The movement of the panels is similar to that of opening a rubbish bin. 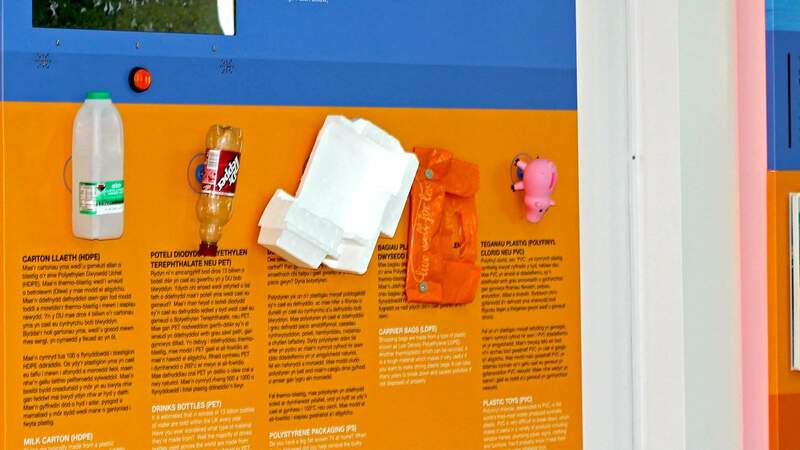 After completing the red zone, visitors will move onto a more explanatory section; where they’ll be met with the effects of waste on the environment. The first board informs visitors about the ‘Great Pacific’s Garbage Patch’ – the largest accumulation of ocean plastic in the world. The board also displays a video presenting the effects waste plastic has on local wildlife. 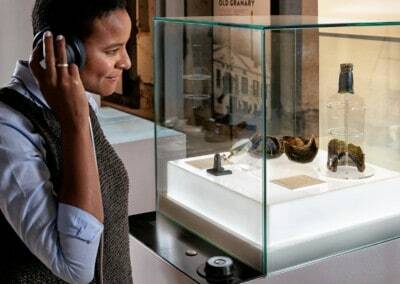 Confronting visitors with a visceral example of the negative impact of waste; encourages them to re-think their actions before throwing rubbish away. Below the 22″ open frame video screen is a selection of real world plastic items that can be found in the garbage patch. Continuing through to the next orange panel, visitors learn about a specific area in the world that is heavily affected by a lack of recycling infrastructure. This is the Maldives – in particular, Thilafushi, the ‘Rubbish Island’, where rubbish from the Maldives is taken and dumped. The existence of this man-made tip, makes the Maldives seem far from paradise. 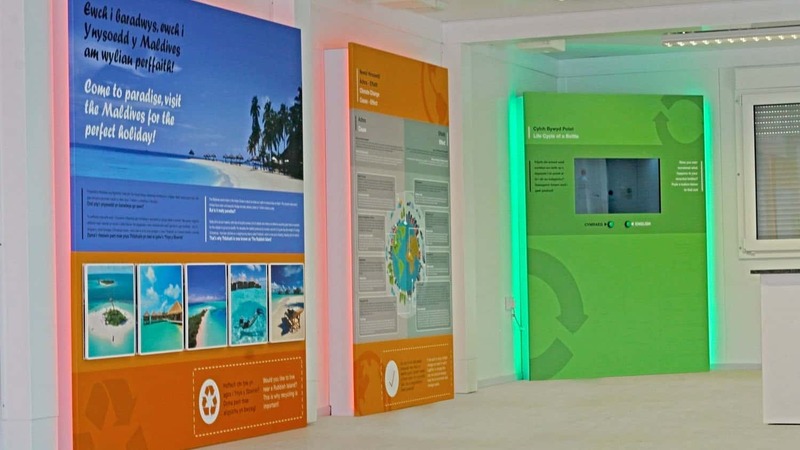 The panel contains lift up boards with beautiful photographs of what everyone sees as the Maldives on the front. 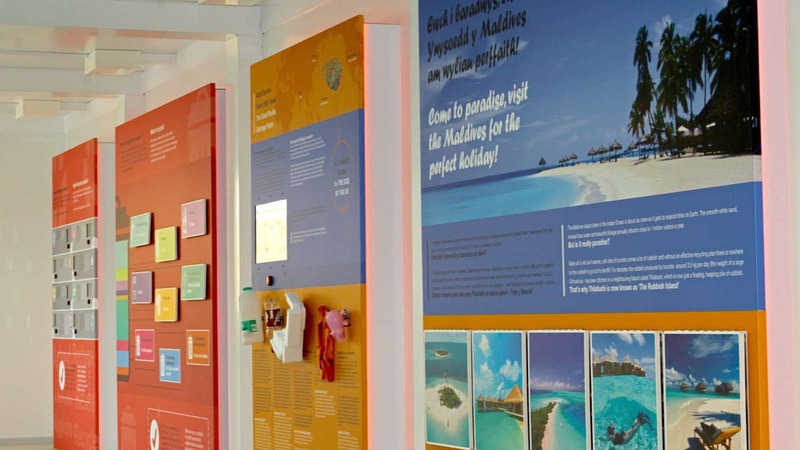 However, when the boards are lifted, they each show a different view of Thilafushi. This juxtaposition of paradise and rubbish dump pushes home the reality of waste and importance of recycling. 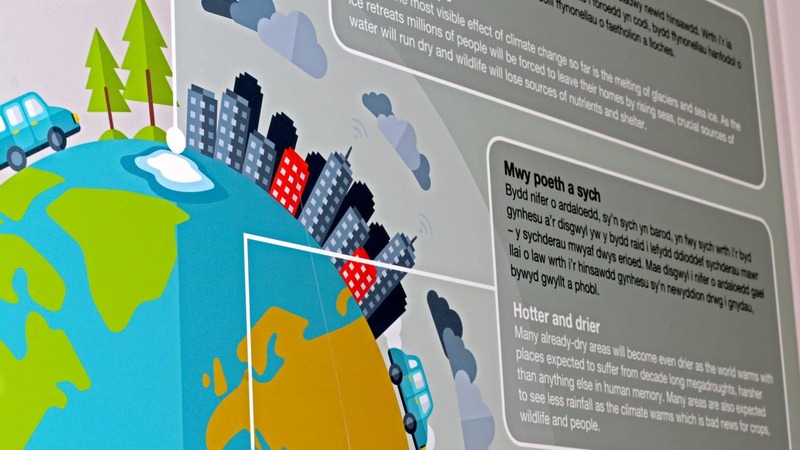 The final signage panel in the orange zone contains information about climate change describing as simply as possible what it is, what causes it and the effect it has on the planet. The first item in the green zone investigates the process of recycling plastic bottles. What appears to be a normal cabinet displaying bottles and a beaker of recycled plastic, is, in fact, a transparent video screen. 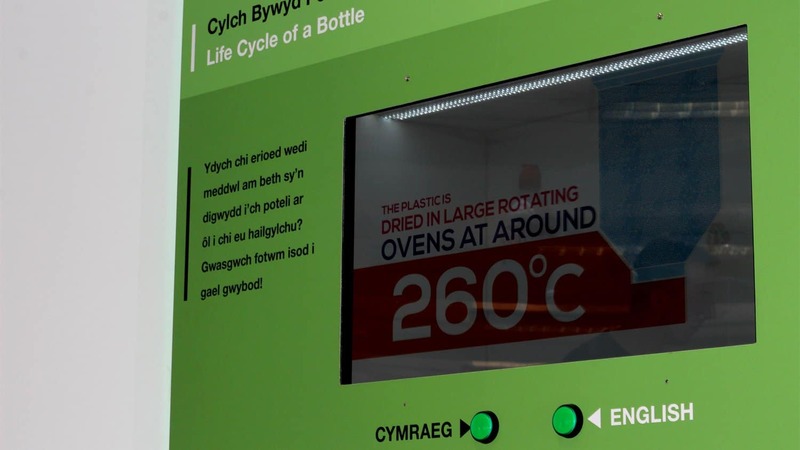 Upon pushing a button the transparent screen begins to play an animated video which follows the life cycle of a bottle. 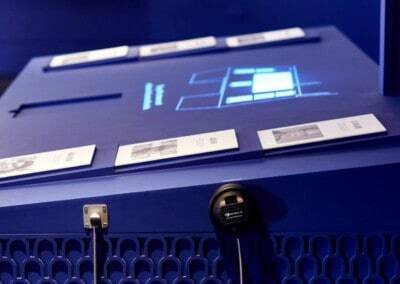 We were responsible for writing and producing the video, as well as developing the hardware solution. On the next panel, we educate visitors on exactly what can be recycled and how. Foamex representations of recyclable items can be picked up and scanned by an adjacent barcode scanner. Scanning the item will activate an informative video on the screen above. Learning about recyclable items in this way makes the process fun but also educational. 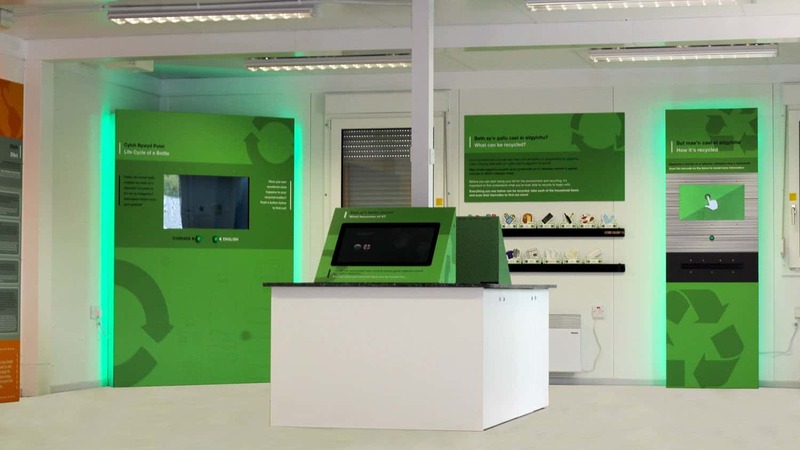 Also in the green zone are two desk mounted interactives placed on a specifically chosen table made from recycled plastics. The first is a recreation of a CCTV control centre, displaying footage of various recycling activities that take place at Bryn Pica. Visitors simply press a button to select a video. 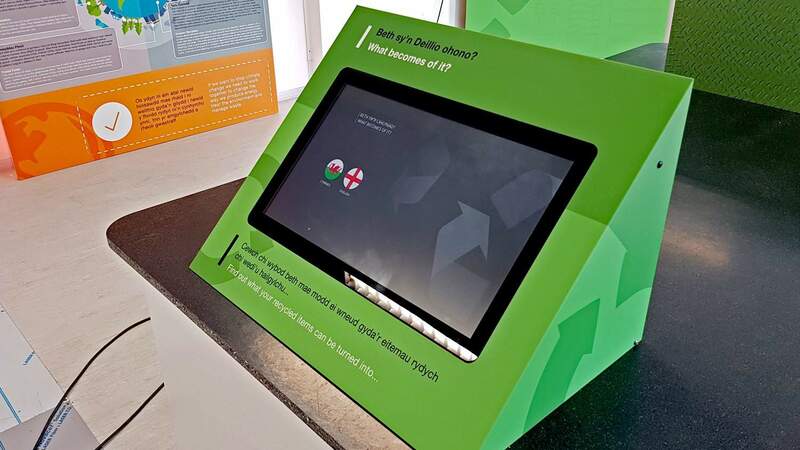 The second interactive is a 22″ touchscreen unit with our off-the-shelf software which displays information on ‘what becomes of it’. Inviting visitors to discover interesting outputs of recycling such as what becomes of used aluminium cans. The final zone is the blue zone where we encourage visitors to take what they’ve learned and do their part. Here you’ll find a quiz which tests the knowledge learned regarding what can and can’t be recycled as well as best practices to live in a renewable way. Doing this in a quiz format which makes it clear when you select a wrong answer out of a choice of two, further pushes home the correct response. 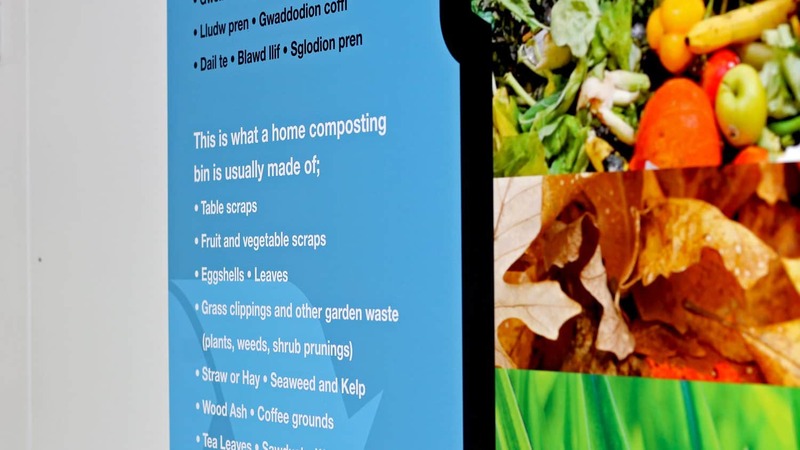 A standard signage panel explains the benefits of at home composting whilst Another signage panel lists Wales’ recycling targets up to 2025, whilst the final interactive element asks visitors if they will “do their part” and pledge to act on what they have learned today. 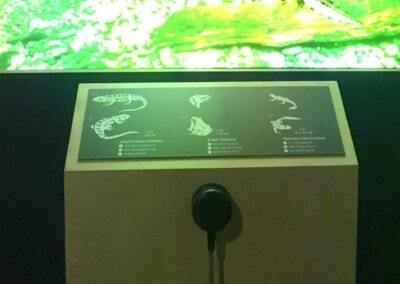 If they choose to do so they can press a button which adds all pledges and displays it on a large LED counter.